Tutorial for Stitching on Soluble Canvas & Free Patterns! A happy Monday all around! 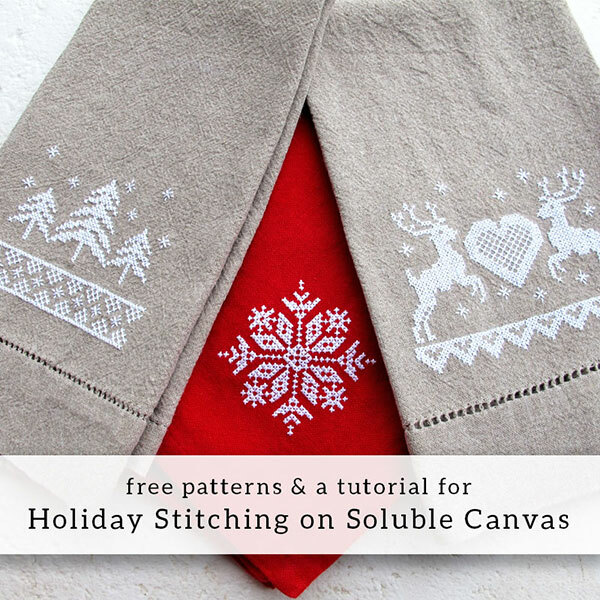 Although there are a mere four days left until Christmas, I want to share with you a tutorial I wrote for using soluble canvas on plain weave fabric, along with three new holiday stitching patterns. These are quick projects to stitch up – even the larger of the three patterns works up fast! – so there’s still time, if you’re adventurous, to whip up a handmade gift or two before Friday. I loved stitching those samples in the photo above! They were fun! I used regular white DMC floss and some embroidery blanks (which I purchased through All About Blanks). When you use blanks (which are pre-finished items normally made for machine embroidery, but which work equally as well for hand embroidery), all you have to do is the fun part – the stitching! The finish work is already done for you! You’ll find a thorough tutorial on how to use DMC water soluble canvas and the free charts for the designs featured above on DMC’s website, Commonthread. You’ll also find suggestions on what to stitch the patterns on and some ideas on gift-giving with handmade items. This past year, I had the pleasure of teaming up with DMC on a series of articles, which you can find on the Commonthread blog, here. There’s one article not published yet and one in the works for next year (due to a delay on my end). It was a lot of fun writing for DMC and a real honor to do so! I consider DMC a stalwart, tried-and-true company in the needlework world, and their blog team was great to work with. I’ve always found DMC threads reliable, and I use them pretty much whenever I need cotton embroidery threads. In fact, they manufacture my two favorite cotton threads, floche and coton a broder. I use their floss and pearl cotton extensively, too. So I was quite happy to team up with them in 2015! I hope you enjoy the tutorial and the free patterns. You can mix and match the patterns with any of the recent folky cross stitch patterns I’ve posted lately, too, which makes them even more fun! I’ll pop in on Thursday of this week to share with you some of my recent stitching adventures. They haven’t been too wildly adventurous, but I’ve managed to finish up a few little bits of stitchery hither and yon. Then I’m going to do something I’ve never done before in the nine years I’ve been writing Needle ‘n Thread: I’m going to take a full-fledged, all-out vacation from the blog, from December 25th through January 4th. During the break, I’ll be focusing calmly on upcoming content for January and 2016, while enjoying a more restful-than-normal Christmas season. I’ll see you on Thursday with an update! Thank you, Mary, for all you do for us. Glad to hear you’re taking a Christmas vacation. Good for you! Take care and looking forward to seeing what you have in store for us in the new year. Soluble canvas is new to me and am intrigued by it so will be trying some. Thank you. Very warm Holiday wishes and please feel well and happy. Mary, it’s good to see you’re still working at your embroidery site. I hope you are managing with the health issues and that the new year will find you doing very well indeed. Have a Merry Christmas. The samples are lovely and just right for Christmas presents or decorations around the house and the tutorial is great. I look forward to seeing your recent stitching on Thursday just in time for Chirstmas. Thanks for sharing the free patterns and tutorials on stitching on soluble canvas very useful for future reference. I hope you will have a great break over the Christmas holidays and look forward to Thursday. I’m going to miss your posts like crazy, but do enjoy your time off Mary. You have earned it and deserve it! These make such beautiful gifts Mary, with not that much outlay in time. Great idea! Oh, good…I wondered whether or not you’d take some time off for some rest, peace, and quiet. Thank you for everything, Mary. Take care of yourself. And I wish you get your health back in 2016. Your first vacation from work in 9 years? Good grief, that’s at least 8 years overdue! I hope it’s refreshing. I saw these on commonthreads earlier today, thanks. I have already downloaded and pricked the snowflake! Glad you’ll have a bit of vacation- you do so much, as Beth P said, and I’m sure more will echo the thought. I would like to add a compliment for your Christmas. While I have done many kinds of stitching & sewing all my life I have always felt intimidated by the learning and skill of others. Having the Royal School of Needlework under my nose doesn’t help. But you have inspired me; you have brought the homeliness and self-taught idea to me and I have learned to stretch myself now. I feel confident to try more and don’t give up so easily. For that, you are my hero. Happy Christmas. Merry Christmas! Get lots of rest and enjoy some quiet time. Thank you for the lovely patterns. Thank you for the tutorial about water-soluble canvas. I never heard the term “railroading” so I watched a video and learned something new today. Having made several cross-stitch items in my years, this would have certainly come in handy. Enjoy your time off. Wishing you and your family and very Merry Christmas and a Happy, Healthy, and Prosperous New Year! Thank you so much for everything you do and share with your devoted followers, we will miss you but everyone of us wishes you a restful vacation and of course we are all wishing you a successful return to good health in 2016.
we wish you a happy vacation and look forward to yr. return packed with lots of goodies. Wishing you a joyous and holy Christmas and thanking you so much for your wonderful humour and great projects over the last year. Everyone is on your side wishing you a safe and quick recovery. Enjoy your holiday! beautiful, but how does the backside look? Or is there something I can sew/iron on the back to make it look better? Hi, Stacey – the backside looks like the backs of the stitches, which is perfectly normal when embroidering table linens. The key is to keep your stitching as neat as possible on the back and only travel tiny distances, following the order of the stitching. Most hand embroidered table linens don’t have any backing on them to hide the embroidery, because the backside is simply the nature of hand embroidery – it’s part of it. As long as you don’t let globs of thread or knots build up, it’s perfectly ok to have the backside of the stitches visible. Hope that helps! Thanks Mary! I usually keep the backside of my stitching very neat so I’m not too worried about that. But I’m not sure how it would hold up to repeated use and washing on a hand towel. Would I need to make some knots instead of traveling on the back? There’s no reason why you can’t use knots. I usually use a couple tiny stab stitches that will be covered by other stitches. Merry Christmas, Mary! Enjoy your time off and put your feet up – you deserve it! Hi Mary! I loved stitching. This tutorial is helpful and those samples are perfect gifts for Christmas. Thank you for your tips. Dear Mary. I have had the greatest pleasure reading your posts and now have finally succumbed. A Christmas tree in a “sort of” Tambour…satin stitch..ish. With colonial knots for the balls (they hide the white patches) and a tiny star at he top. It is a work for you and your inspiration. Regards. Susan. Will miss your daily emails as they have become part of my daily routine, but am happy to hear that you will be able to spend some quality time with your family. My prayers are with you and hope that your treatment is successful. You have been such an inspiration to me trying new things. Every opportunity I have, I share your website with friends, family and strangers. I work in a craft store, so have many chances to share. I continue to go back to previous projects that you have shared and enjoy everyone of them. Just wish there was more time in a day to do everything I would like. Thank you for all the encouragement you give us and the talent you have that you share with us. There are so many wishing the best for you in this new challenge! Add me to the list of those thinking of you. We are so grateful for all that you have shared with us. Next Next post: A Merry Christmas to All!